For newly constructed walls, the best drywall primer is not the most expensive primer. For new walls (with no stains etc) you do not need a stain-blocker or a hole-filler. Zinsser has a very good primer: here's the one gallon. If you need a lot, here is the 5-gallon size that we buy. Primer keeps for years, even if you do not use it all, these are both equally considered to be the best interior primer. Kilz also has a good primer available online. Even the best interior primer does not have a lot of firepower (explained below). But we don’t believe in cheap paints: they cost more in the end: so just get what you need to do it right and save your money for the cool shops in Acapulco. A really great deal is Benjamin Moore’s Drywall Primer Interior Latex . Remember many primers and paints use toxic ingredients. Read the label and read more in my post about the deadly VOCs. The best drywall primer is less expensive than other serious primers. The drywall paper and the drywall compound (“mud”) are both porous surfaces but they absorb paint at different rates. If you do not equalize them with a primer made for this new wall, you will see the difference and it looks sloppy. High-quality primers are not that expensive and do not contain additives that are expensive. Buy just what you need, as overkill will just be a waste of money. Important tip: With your drywall primer, use a quality roller like this one, not a low-cost one! Cheap rollers shed lint onto your wall which will cause your wall to feel (and look) like sandpaper. Not only that but rollers are easy to clean. You can soak a good roller cover for days in water and let most of the primer fall to the bottom of your bucket. You can then rinse and even put back on your roller frame to spin it dry. Easy. We use Purdy and Wooster wool/poly blend rollers. The wool gives it absorbancy and the polyester gives it longevity. We use a single roller all day, day after day. You can always apply drywall compound to a crack, wait for it to dry and re-sand. We normally use quick-dry spackle or quick dry caulk as we cannot wait. After the joint compound is all sanded the first thing to do is to dry brush the dust off the walls (it clings). Then, without stirring up too much dust, gently sweep the floor. You can use a Shop-Vac with a paper filter, (not your house vac: it will die), then mop the floor. Apply 1 coat of your chosen drywall primer sealer (see below). All drywall primers are relatively fast drying. Drying time depends on lots of factors like ventilation and humidity. You only need to apply 1 coat of drywall sealer primer. Don’t delay too long after it is dry before the next coat or before painting. New drywall requires 3 coats? Mostly yes, and the first must be a drywall primer sealer. There is good news coming below, however about that primer. Having said that, painting brand new walls is the only time I’d consider using a paint and primer in one, which may save you one coat of paint. See the section on Paint and Primer in One below. This is definitely not the best drywall primer. If you do, buy a quality paint and primer in one: use Kilz, a very good name in drywall sealer, and for sure one of the best paint and primer in one. I would trust this product, it is also a primer with low VOCs. For you traditional 3-coaters, the first good news is that you don’t have to buy some exotic or expensive primer (assuming you have no mold or stains) for priming drywalls. You don’t need oil-based primer either. 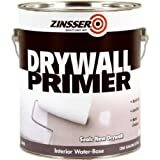 The best drywall primers are the lowest-cost primers, as they contain only what is needed: a normal drywall sealer do not need ingredients to seal stains, odors, mold, etc. If your unpainted drywall has been waiting for a long time, especially in a basement, it may have sprouted some mold or mildew. In this case, you’ll need a little more firepower. If so, you’ll need to read the last section of this post. Why not just put on 2 coats of paint? One word: Flashing. Because you will see the seams (and screw holes, tape and bead) where the joint compound a.k.a. ‘mud’ meets the paper that is the outer face of the rock. The paper and the drywall compound are a similar porous surface but they absorb paint at different rates (this goes for every coat of regular paint that you might apply without a drywall primer sealer). Yours Truly learned the hard way: I know you can end up with terrible flashing! So the drywall primer sealer is designed with just the right sealants to stop the different rates of absorption and there will be no difference in sheen or color changes in your finish paint. 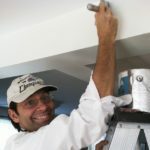 Some painters say leftover flat (and only flat) paint is as good as the best drywall primer and will give a good result. Hmm. Proceed at your own risk. I have never found this to work out but I need to make the job perfect: perhaps you don’t. More good news: you do not have to apply a normal heavy coat of paint as you will with your top coats; you just need to give the new wall a drink, and the job is done. Get the can of primer well shaken (or stirred, Mr. Bond). This coat can be very fast: you will be done in half the time of painting one of your top coats. Calculate that into your expected quantity (but all paint seller accept unopened cans in return). Even the very best drywall primer does not have to be a heavy coat: just a film will do. Do not use your good vacuum: this dust will kill it !! Then after the floor is mostly clean, mop it. Yes, mop. You don’t want to be kicking around the dust as you finish your paint. This fine dust seems harmless but it will stick to freshly painted walls and turn your new project into vertical sandpaper: ick. Wear some kind of mask. For non-toxic dust, a honeycomb mask will be fine. Paint and Primer in One: not the best drywall primer! Probably ok for your home use, but I cannot say for sure that with paint and primer in one you will not see the difference in the sections of the wall: joints vs. paper, but feel free to try. It is not the best drywall primer solution, but for walls in good new condition, some paints do promise to equalize the surfaces at the same time they leave your color. I understand you may be very tempted because you have painted before and you want to cut out a whole coat. 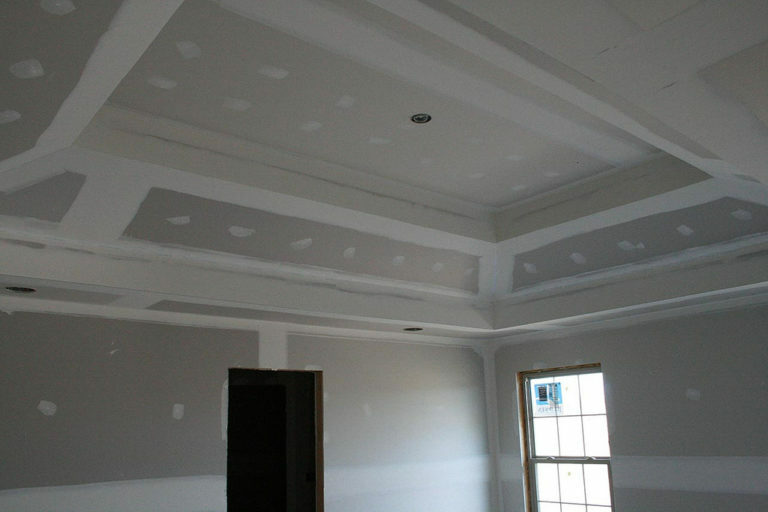 But remember that the result will not be the same as a traditional 3-coat job using the best primer for drywall. Here a more complete post on paint and primer. Can I use regular house paint as a primer? Yes, but no. You will have the blotchy look we discuss above, but you will save the cost of the new primer. Don’t use exterior paints though, as they are very toxic inside a house. If going this way, try to use flat paint. Yes, and we do this in large newly constructed rooms. This means renting or buying a sprayer, but it can save loads of time. You need to know what you are doing or be ready to get stuck in a time sink. This is especially fast for highly textured walls. Can I use spray cans? Yes for small areas: if you find some imperfections on your wall after you paint and you’d like to quickly prime it, a small can of spray primer may be just the thing. Be aware that most spray primers contain more than you need to seal drywall and will be very hard to clean off if they go astray in the air so mask the floor etc. Can I use drywall primer on wood? No, you probably need a shellac in our first coat product. Most wood will have sap (which will bleed through a simple primer like drywall primer and every coat of paint you put on after that. Also, the wood’s tree rings that absorb at different rates (the dark ring vs the light ring). Why is that bad? The softer ring will expand differently as the primer dries and you will not be left with a smooth surface. We use BIN alcohol-based prime, a white shellac, when priming almost all woods. For that, you need rubbing alcohol for clean-up. How long do I have to wait after priming drywall to paint? Especially with drywall, you will find that the ‘mud’ and the paper of the main sections dry at different speeds. You can easily tell when the last of the primer is dry, usually an hour or two. Don’t rush this step! All drywall primers are relatively fast drying. Some paint makers will say you must paint within 48 hours after letting the primer dry, but I have never seen any problem waiting longer with the best drywall primer. Dust clinging to the wall while you delay is the only real problem: just use a broom and vacuum and/or mop (see above). Can I use a primer (or any paint for that matter) to fill small cracks? Not really. Some high hiding primers exist and they will fill more cracks than other primers, but at what cost? Drywall primer is cheap so we just fill cracks by hand. If you do manage to have some very small cracks go away after painting, you will find they re-crack quickly in time. Remember that the wall will have the same contour after it is painted as it did before. Cracks can be caulked (usually just for corners) or spackled (some quick dry spackles will not shrink-they cost more but they are all we use). You can always apply drywall compound to a crack, wait for it to dry and re-sand.We normally use quick-dry spackle or quick dry caulk as we cannot wait. Can I tint my drywall primer? Especially if you are about to paint with a red, and that includes red-browns, tint your primer gray. Red is notorious due to the colorants that are used to achieve your color, almost all shades of red do not cover well. For some reason a chemist can tell you, the gray primer allows the coverage to maximize. How can I achieve a Level 5 Drywall finish? You may have heard of different levels of finish, including Level 5 drywall (the smoothest) or skim coating, and so on. 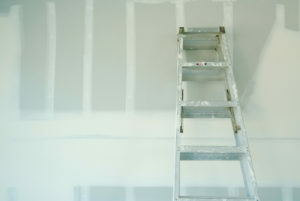 A great website for all you ever need to know and more is drywall101.com. It’s all well described on youtube: if you can afford it, this is the very best drywall for your home. This goes beyond the best drywall primer for $ure. If you just put normal drywall primer sealer over mold (or the black type called mildew), it will continue to grow and that is a two-way street—mold grows into and behind the wall and moves around anywhere that air can penetrate. So if see mold and you have started painting, you must stop seal it as soon as you see it. Try my system of buying a cheap paint brush, cutting the handle so it fits in a small jar. Pour some of your primer in that jar and use that for your spot priming. The best primer for drywall, in this case, is the BIN we mentioned above. If you have chemical sensitivities, you should call a professional as this is hazardous work. Bleach is the unfortunate first step. You will need a chemical respirator and/or a very well ventilated room because bleach is deadly. Make your solution about 1 part bleach to 4 parts water and apply with a sponge. Let the excess water fall down onto an old towel or cloth that will be throwing away. If the area is very black with growth, you may need a stiff bristle brush to get it loose. Let the area dry before primer is applied. A dehumidifier may be helpful here. You proceed in the steps of how to paint a room just like any other room which I have written about. 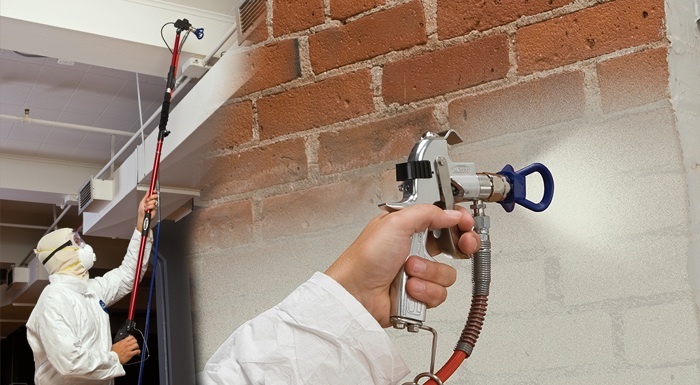 A cool tool to keep your drywall mud stirred and ready: it attaches to any drill or screw-gun and hangs from the ceiling when not in use. Cool. Only about $10. 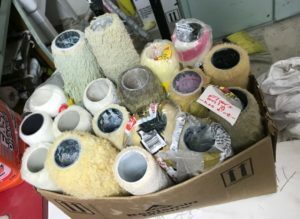 All you ever needed to know about the difference between sealers, primers, and undercoats in one short article from some good kiwi people in New Zealand. Brad, thank you for all the great info on primer, paint, and applying them. You are a plethora of information, that’s a good thing and if I was to hire a first class painter, you would be my 1st and only chose, if you want the best you have start with the best, you and I have made all the mistakes, now we think we are a well oiled machine *$*@+(/*& strike that, we know we are a well oiled machine! One more thing, I’m a finish carpenter, and a level 5, again thank you. This is a saying that a old man laid on me a long time ago and it will stand the test of time. THE BITTERNESS OF POOR QUALITY LINGERS LONGER THAN THE SWEETNESS OF A LOW PRICE….. If I am skim coating a textured wall with all purpose compound, for the purpose of installing wallpaper, do I need to use any of the recommended primers before wallpapering? The skim coating left behind a dusty feel to the wall that the wallpaper is not adhering to very well. 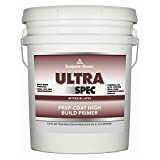 I haven’t been able to find information on the proper primer to use over the skim coat. Thank you! Hi and thanks for writing. Yes, although I did very little paper professionally, it sounds to me that you need a bonding surface and if it is powdery or chalky, your paper will probably not last long. Go with the low-cost drywall primer on this ‘Best Drywall Primer’ post. Good luck! New drywall against lip of new stand up shower install. What’s the order for these next four steps? I’m thinking caulk, prime, texture, paint. Thanks. Dan. Hi Dan, thanks for writing. You have it almost right… just do the primer before the caulk. The sealed drywall can grab better than the porous paper of the drywall. If your texture material is porous also, do that before priming. If it is ‘drywall mud’, it will need primer. Write again if not sure, and good luck! My house is 7 years old and all the walls are textured finish and painted in cottage cream. I want to repaint ceilings and walls. What are your recommendations for primer, wall paint and ceiling paint and how many coats. Thank you. Whether your ceilings are textured or not… I’m guessing not?…. if they have staining or discoloration, yes use a primer. If not discolored, then probably no primer. Hard to say without seeing it. Since you don’t want to put an expensive ceiling paint (use the best and you’ll only need one coat) and then see stains bleeding through, perhaps you should do a primer coat. I would. Probably less work in the end. Dust with broom, prime with roller only…probably no brushing in corners for primer, then use the Ben Moore ceiling paint. No doubts then. Good luck! Hi. The ordinary drywall primer is made for green board too, but if you have any concern about it getting wet, go with the oil. It’s much nastier, though they say ‘no odor’…still wear a respirator please. We have a respirator post that simplifies that too. Key is to seal out the moisture from getting under your tile/shower etc. I just got done priming a finished basement ceiling with milk paint with a bonding agent. The suggestion that the milk paint company gave was: “do not use primer, milk paint should be applied directly to the material so that it can penetrate”. Milk paint is twice as expensive as a water-based primer and the coverage is significantly less per gallon; as well it requires mixing and waiting. I know that this is a long shot because you are probably wondering just exactly is milk paint, but, do you know if milk paint will ‘adhere’ to primed sheetrock walls? It makes sense that it would because milk paint itself, is applied in two (at least) coats, and certainly ‘adheres’ to itself. But I would like my theory confirmed. I’ve never used it, but a quick google search agrees with you…you can put on drywall without primer. I have seen that brand around the internets… Is there any problem? Thank you for this nice article. 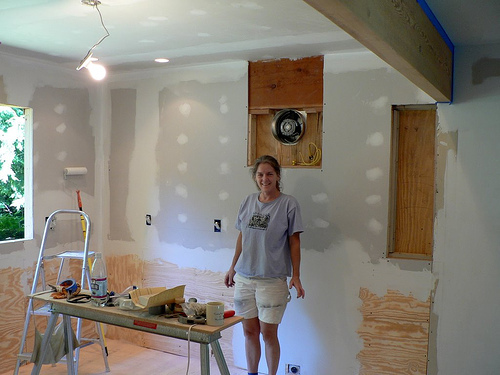 I’m finishing my basement and I drywall it with the brown paper inside (i know – never drink and finish a basement). I spray it with RX35 last night and was wondering if I need a second Coat of the RX35 from Roman or I should be focused on 2-3 primer coats. What primer do you recommend? Hi. Did the paper wrinkle up? I would think it’s all gooey now…but if not, don’t just start painting, get a brush in the finish paint and do a square foot and be sure to cross a seam to see if the seam is different from the middle of the rock board. Let me know here? A photo would be helpful to future readers. Funny story, but you should definitely drink and paint! So many mornings in paint stores I could smell it on the breath of hungover painters: they have a bad rep for that for good reason. SOmehow I escaped that trap! Good luck! I spoke to someone at ‘Real Milk Paint’, and he told me that ‘their’ milk paint will adhere to Zinsser Bulls Eye 123. I found that an article in their web site confirms this as well. Problems- Priming with milk paint costs $50/ gallon. Coverage is poor- 3 gal./450 sq ft.
After painting the basement ceiling of my project with it and burning up 3 gal. with my new airless sprayer (which may well be part of the problem), I decided that I need a different approach, such as priming with a water-based primer before coating with milk paint. Or perhaps rather, forgetting about milk paint on the ceiling and walls (or even just the ceiling), and using regular water-based. I NEED the milk paint for the cabinets; I love the finish I get with it by sanding/burnishing, and refuse to burn it all up on the ceiling. The appeal of milk paint? Totally natural, you could probably drink some. I am basically sick of things that are man-made if there is another, natural option. I have read that the pyramids were coated with milk paint. Question- How does one avoid the initial Burst/Blast of paint when depressing the trigger on the sprayer when spraying a large surface? Yes, I saw that about milk paint but never heard that about the pyramids. I did hear they probably used water and floats to lift the blocks! Anyway, spraying takes a touch. The thing to do is to keep the tip moving quickly when you first squeeze and then when you reverse direction to give a quick flip of the wrist. Practice with water on your house or just into cardboard etc. Milk paint is going to get a post here in the future I think now based on your comments. Thanks for all that and good luck!! New Tools for the Handy-Person Who Has Everything, or Not Enough of Anything. 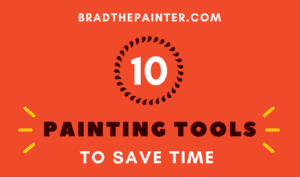 Brad the Painter – Painting Tips by a Professional offers advice and recommendations on how to do your painting project well, safe and fast. You’ll find tips known only to the pros, and tools that save time and money. Brad has been in the business for well over 30 years, and is now in semi-retirement passing on the secrets to you. There really need not be any dread of painting by yourself. There are tools that do not cost much that save you time and cut through frustration. “Brad gave us great advice on colour and design, gave us a timely quote and worked quickly and carefully on painting our basement walls, trim, and around some tricky rocks.” Barbara I.
Bradthepainter.com – Painting Tips by a Professional is supported by readers. We do not advertise and we receive no compensation from the manufacturers we recommend. Our referral links, which do not cost the user anything extra, allow us to keep this website going. We are a participant in the Amazon Services LLC Associates Program, an affiliate advertising program designed to provide a means for us to earn fees by linking to Amazon.com and affiliated sites. Certain content that appears on this site comes from amazon services llc. This content is provided ‘as is’ and is subject to change or removal at any time.